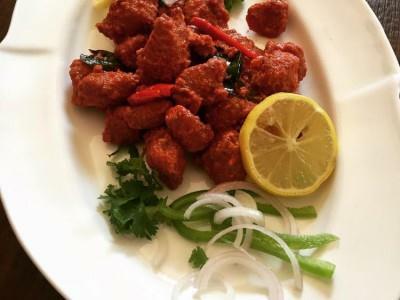 Chennai’s favorite non-veg snack is devilish red and spicy -truly mouthwatering chicken. This is one snack that looks great on a plate -Candy red chicken pieces tossed together with all greens. A recipe invented by Mr Buhari in Chennai in 1965 and named it Chicken 65 to match the year of its creation. He never patented it and it became a recipe of every Indian restaurants in years to come. Later on he created several of them and named them according to year of its creation, but his original Creation still carries the Crown. Mix all the marinade together in bowl and combine with the chicken until coated well. Allow to marinate for at least an hour. Combine all the sauce ingredients in a bowl and set aside. for batter ,beat the egg and combine with the other ingredient until smooth paste stir with the marinated chicken. In a Wok heat oil and deep fry the chicken on medium flame till golden . Add 2tbsp fresh oil ,saute garlic and ginger for few second until aromatic then add curry patta and green chilies and fried chicken pieces. Add the yogurt sauce mixture and cook on a medium flame until it is almost absorbed an the chicken pieces are almost dry. Garnish your chicken pieces with chopped coriander and serve. This recipe can be used as snack in any party or gatherings and even an iftar dish during the month of ramadan . this chicken dish looks so good ! !